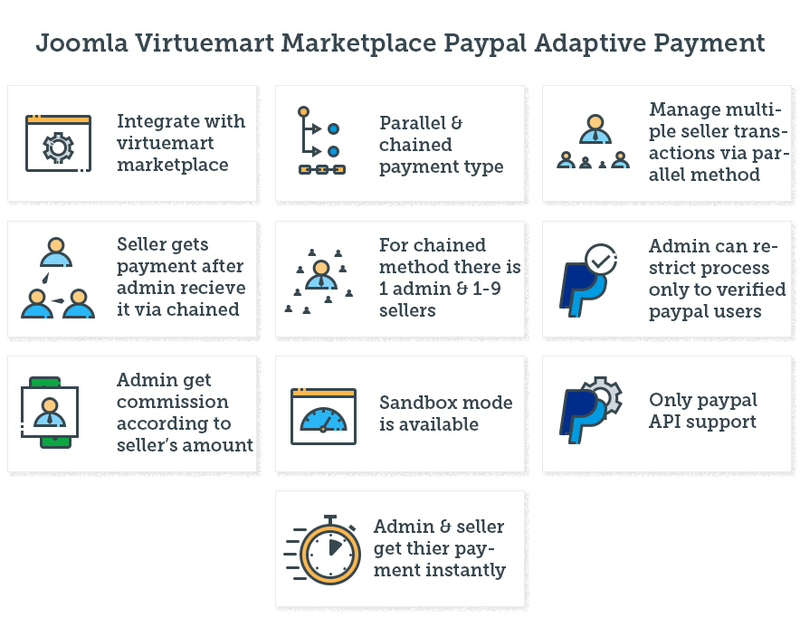 Virtuemart Marketplace Paypal Adaptive Payment: Joomla Virtuemart Marketplace Paypal Adaptive is a splendid extension integrates your Joomla Virtuemart Marketplace site with Paypal Adaptive payment gateway. The payment gateway manages and handles the payment between the sender and one or more receivers of the payment. This module is an addon of Joomla Virtuemart Marketplace Extension.To use this module you must have installed first webkul marketplace module . Virtuemart Marketplace Paypal Adaptive Payment - This splendid extension integrates your Joomla Virtuemart Marketplace site with Paypal Adaptive payment gateway. The payment gateway manages and handles the payment between the sender and one or more receivers of the payment. Well integrated with Joomla Virtuemart Multivendor Marketplace. Supports parallel and chained payment types. Parallel payment manages the transaction which is being sent to multiple sellers. For the parallel, the payment can be split among 2-6 receivers. Chained payments manage the transaction which is first being received by admin. Redistribution of remaining payment to the sellers. For chained payment, there can be at most one primary receiver/admin and 1-9 secondary receivers/seller. Admin can restrict the transaction for PayPal adaptive payment. He can receive payment from verified PayPal account users/buyers. Admin commission will be divided as based on seller payment amount. The option of sandbox mode is provided. Only Paypal API support found. Did you buy Virtuemart Marketplace Paypal Adaptive Payment?